I had never before been to River Ridge Golf & Country Club, in the Windermere area of Edmonton, Alberta, and now that I have, I wonder why. Tucked along the beautiful North Saskatchewan River, the course offers 18 beautiful and isolated holes, away from the city noise, without being far away from the city. I booked here because the pictures looked nice, and the price was absolutely right, at $55 for 18 holes that included a power cart (it would be advisable to have a cart on this course, as there are some long journeys between some of the holes, and a walk would actually take a while). The course is wonderfully laid out, some of the holes being right alongside Edmonton’s main river, offering great views for your entire round. 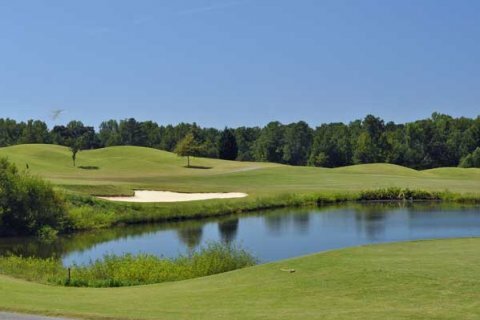 With the river, and frequent water hazards, and trees on pretty much every hole, River Ridge is a pretty challenging course for the average golfer. Many holes are heavily dog legged, and being straight off the tee is paramount in many cases. The greens, and the whole course, were in tremendous shape, and many of them offered challenging, but not ridiculous, lies. You won’t have to be putting straight all day here, you will get the chance to read the greens and try and execute some cool, bending putts. The course even offers some wildlife, as there were plenty of ducks and geese along some of the water holes, although they weren’t a disruption to the game. There was even a deer on the 10th hole that decided to wander around the green for a little while. I managed to pull of a decent first nine, despite my drivers and putter completely abandoning me. Having a solid iron game on the front saved me from what could have been a terrible score. I saved my terrible score for the back nine. It was still a nice course, and a great day to golf. The marshall comes by often, and is quite friendly. He will give advice on holes, tell you about the course, ask you how your day is going, even chase a goose away for you. The beer cart girl is your typical beer cart girl, but she didn’t come by as often as I would have liked, especially since it was a very hot day outside, and more beverages could have been consumed. But, she was quite cool with us, given that she did bust us with some outside drinks that we brought in. The pro shop is solid, with a quick and knowledgeable staff inside, and a good selection of clothing and items in case you need to stock up your bag before hitting the course. Upstairs, the clubhouse offered great views of the course, had some pretty good food, and some reasonable prices to go along with it. They could use some umbrellas on their outdoor tables, especially for days when it is 30 degrees and cooking outside, but besides that, there is nothing to complain about. River Ridge is a great little escape within the city limits. Normally, you wouldn’t expect such isolation from a city course, but River Ridge is definitely the best place I have golfed this summer, and at the prices, will be well worth it to go back. Now I just need to find my golf game in order to compete with the tougher course. The City of Edmonton operates a few of their own golf courses sprinkled throughout the city, and while we may think of them as being run down, neglected courses, this is not the case. The Millwoods Golf Club is a nice course inside the city, and one that is perfect for beginners, given its wide open fairways and lack of hazards throughout the course. The course is located just past the Millwoods Park, a popular destination for families in the area during the summer time. But the course is tucked away behind all the picnics and screaming kids, and offers a nice, secluded area to play for the day. The clubhouse is warm and friendly, housing a great staff that is very kind and helpful. It is nice to see a clubhouse where the people inside know things about golf, and care about the sport, making them able to either help you with any questions, or joke around with you. There were no surly teen workers texting away to be seen here. The rates at Millwoods are very reasonable. I paid $56 for 18 holes and a power cart, which is a great price. I did receive a $10 discount on my green fees as they had recently aerated the greens (which ended up being fine, it did not affect my terrible putting one way or another). At the first hole, there is a starter who is there to tell you when to go, and she did a good job of making sure all was in order. She will also offer you a complimentary bottle of water. This was welcomed, since it was one of the smoking hot days of the Edmonton summer in which we decided to play there. 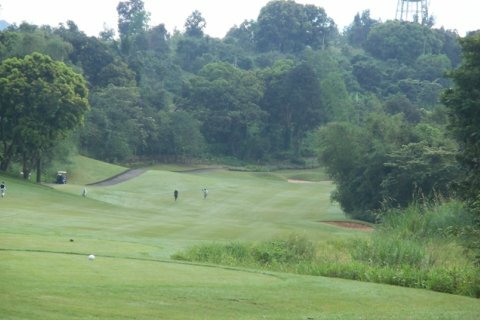 As I said, the course is very wide-open, which is perfect for the golfer who wants to play, but doesn’t want to lose 10 balls over the course of the round. Even with my impressive hooked shots, I didn’t lose a single ball during the day, which is always nice. The rough is not too surly, and can be fairly forgiving if you are not dead-on with your tee shots. One great thing about this course was that it wasn’t very busy. Granted, I golfed there during a weekday, but at one point, the beer cart girl told us that we were the only people on the back nine. This is always nice, allowing you to play at your own pace, and not feel the pressure from the people behind you. We started behind a foursome, but with the starter being sure to space things out nicely, we never ran into them again, and never needed to wait for them at another hole. This freedom makes for an extra relaxing day. The views on the course are not the most beautiful you will find in the city, that is for sure, but this is a public course that serves the purpose of letting people play golf in a relaxed environment on a not-overly challenging course. The greens were the roughest part of the course, as they had been recently aerated, leaving them hard and fast. As I mentioned, my putting is atrocious, but the speed of the greens often made them difficult to read. Aside from that, they are pretty straightforward, with very little break on the majority of the holes. 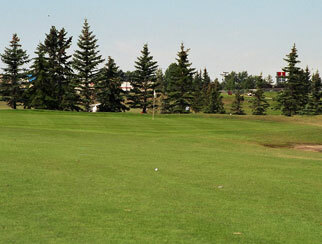 In all, for the price, Millwoods golf course is a great place to play. Higher end players will be able to put up some of their career best scores, and newer players will be able to play without absolutely lighting up the scoreboard. 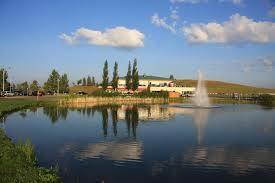 I would definitely recommend Millwoods Golf Course, especially for those who live close, on the south side of town. Sherwood Golf and Country Club is a 9-hole course located in Sherwood Park, Alberta, just off Wye Road on Range Road 233. The first indication I got of the quality of this course was the very poor signage leading up to it. There is nothing on Wye Road indicating a course coming up, and I passed the exit I needed (also, I hate the road signs in Sherwood Park, so hard to read from a distance). Once you are going down the Range Road, you will come to a strangely placed roundabout, which finally provides the first indication of the course. The course itself isn’t viewed from the road, but the big, dusty parking lot is, and the shanty/clubhouse is sort of seen from behind the poorly organized cars in the lot. Inside the plain clubhouse, the service is quite slow, as the employees seemed to get confused quite easily. While our tee times were approaching, the girl at the counter took several minutes to figure out that she didn’t make a tee time for the group in front of me in the first place, probably why she was having trouble finding it for them. So, eventually she decided to make them a tee time. Makes sense. It took a while for me to simply pay for my round. There was a distinctive lack of friendliness from her as I paid. That was the worst part about the round. Poor signage getting there, and poor, very slow service inside. Aside from that, the round started promisingly. There is a starter on the first hole, but he seemed equally as confused as to who was up at what time as the people inside the shop, so he was not exactly needed. We worked it out with the other players, and got our round underway. The course itself it quite nice. The holes are generally well taken care of, and the greens were in great shape. There was a couple spots of standing water from the rains the day before, but nothing serious. There were also a couple of muddy places that really needed some work, but generally, the fairways were nice, the rough is definitely not too intimidating, there is a decent number of white sand bunkers along the way, and some nice rolling hills on a couple of the holes. They really pack people in there with their tee times, however, which causes waits at nearly every hole. They should consider expanding the time between players, so you won’t need to have three groups waiting on a par-5. The player skill level, from what I saw, was not the highest at this course, so you could be stuck behind the group that takes three shots to get it past the tee boxes (not that my game is anything to write home about). This level of player probably comes from the very reasonable price of $26 for nine holes. The difficulty on this course is not high. There are hazards, like some forest, many bunkers, and the occasional water that pops in and out of the course, but they are not crippling, and are generally pretty easy to avoid. I managed to play the whole round while only losing one ball, a rarity in my game. There are definitely issues at Sherwood Golf and Country Club that could easily be fixed. Some signs, a competent and organized staff, a little more love on fixing the parts that need repair, a couple of extra minutes between tee times, and maybe a net that protects drives from the highway on hole #2. It doesn’t take much of a slice to send a ball screaming into the traffic, which is dangerous for everybody involved. If you are a drinker, the advantage of a nine-hole course is that the beer cart girl is much more present than on a full course. During our round, she came by three or four times, which is great. She was very friendly. The marshall will typically do a couple of laps as well. I don’t think that I would go running back to this golf course. It is decent, but I feel that there are better options out there, for a similar price. There are parts of the course that look really nice, and you can tell where they put all of their money in. The green on the ninth hole has a nice little bridge leading over water to it, which looks great. Many of the later holes are lined by massive houses, which gives the impression of the country club feel, and makes the course look that much more impressive. But, probably not enough to get me back.